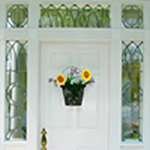 The entry area of your home is most important, as it creates the first impression to any visitor. It’s often said that you don’t get a second chance to make a first impression. 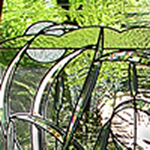 Our leaded glass creations help to transform plain or uninviting environments into a new world of elegance, charm and warmth -- even without the use of color. 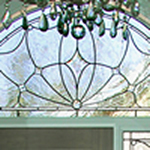 By utilizing irregular clear restoration glass, patinated darkened leads & rosettes, featureless window openings acquire a rich artisinal character. A family owned and run studio, we are committed to your delight in the results of our collaboration with you. Besides this website, our main form of advertising is word of mouth from happy previous clients over four decades. Together, we’ll arrive at just the right design and glass that work best with the architecture and décor of your present or future home. Especially for entryways, we tailor our glass choices to provide for just the right amount of privacy & security you’re looking for by the use of clear textures,bevels & faceted jewels. Even without the use of color, the sparkling quality of sunlight captured in varying glass textures is absolutely radiant. These panels change constantly with varying sunlight, at once brilliant by day and subtly luminous at night.We insure your satisfaction by using only the highest grades of glass, workmanship and design. 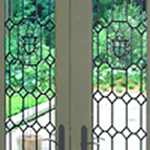 Renaissance Studio provides a complete complement of services relating to the design ,creation, installation and maintenance of your entry windows. Should accident, vandalism or acts of nature occur, our decades of experience assure the return of your windows to their original condition and value.